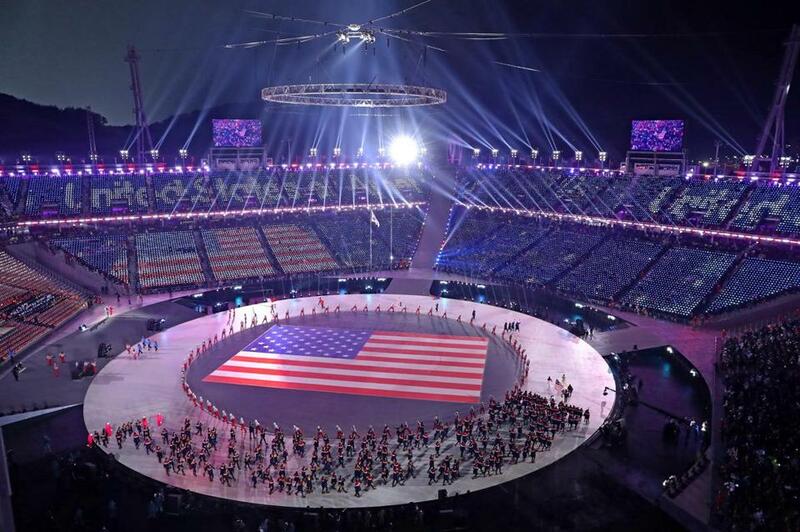 A general view as United States athletes entered the stadium during the Opening Ceremony on Friday. PYEONGCHANG, South Korea — The world starts watching now. At least, when it comes to sports. After two failed bids, billions of dollars in preparation and a nagging national debate about whether it’s all worth it, the Winter Olympics open Friday in PyeongChang with a gala ceremony meant to showcase South Korea’s rise from poverty and war into one of Asia’s most modern nations. The isolated, rugged mountain town of PyeongChang, one of the poorest, coldest and most disgruntled parts of an otherwise prosperous South Korea, will be a global player for two weeks of winter sports, Olympic spectacle and, just maybe, a bit of inter-Korean reconciliation. ‘‘Everybody make some noise!’’ two pre-ceremony emcees shouted in English and Korean as spectators streamed into the Olympic Stadium before the ceremony. Members of a delegation from North Korea, part of an extraordinary Olympics partnership between the two Korean rivals, watched from the seats. Will the Russians who aren’t Russians — the 168 who have been invited as ‘‘Olympic Athletes from Russia,’’ competing in neutral uniforms under the Olympic flag — bring home gold? Will Patrick Chan of Canada hit his quad jumps and claim figure skating glory? Can reigning men’s gold medalist Yuzuru Hanyu of Japan overcome injury and defend his title against Chan? Will the past and present star of American skiing, Lindsey Vonn, be surpassed by the likely future of the sport, Mikaela Shiffrin? North Korean dictator Kim Jong Un’s sister, making an unprecedented visit to South Korean soil, will now likely attend the same opening ceremony as U.S. Vice President Mike Pence, who’s vowing toughest-ever sanctions on the North. Could they meet? That and other theories have engulfed South Korean media. 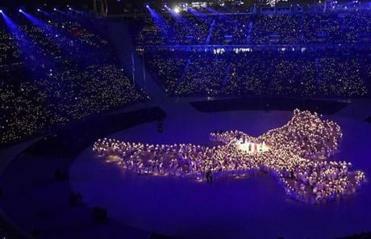 PyeongChang was not supposed to share the spotlight with Pyongyang. This was not supposed to be, as some in Seoul grumble, the ‘‘Pyongyang Games,’’ a play on the North Korean capital’s phonetic similarity to PyeongChang. Could PyeongChang’s initial pitch — that it could contribute to peace on the Korean Peninsula — actually become reality? The opening ceremony will offer at least some hints about that, and maybe more. What’s certain is that these Games, more so than any in recent memory, are about far more than sports.